The new dropdown contains relocated options for both standard posts and featured posts. Since we are continually adding features in the editor we have begun running out of space to display these options. Today are we launching a new editor dropdown so that we can free up space and to make it less visually crowded. Standard post editor: before and after dropdown. We have moved the Quotable Icon and the Review Icon into the new dropdown located on the right side of the editor options. Featured post editor: before and after dropdown. 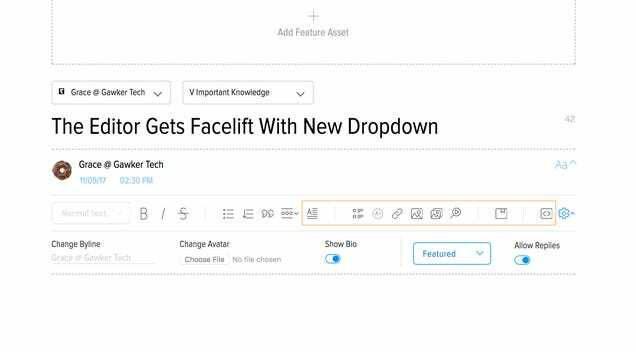 We have moved the Quotable Icon, Review Icon, Dropcap Icon, and new Full Bleed Widget icon into the new dropdown located on the right side of the editor options. These changes should not affect the functionality of the relocated options.